Ippolita Lollitini Sterling Silver Necklace in Eclipse, 16"
IppolitaLollitini Sterling Silver Necklace in Eclipse, 16"
Ippolita "Lollitini" necklace from the Lollipop® Collection. Sterling silver chain with 17 round-cut stone stations. Eclipse assortment: Hematite, Swiss and London Blue Topaz, Onyx. Approx. 16"L with 2" extender. 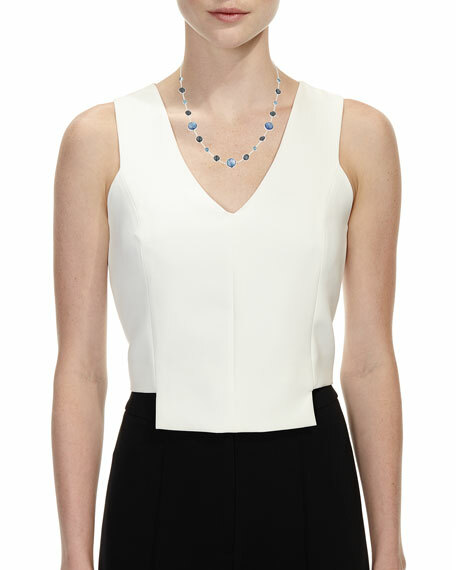 EXCLUSIVELY AT NEIMAN MARCUS Nova bead cluster necklace by Ippolita. Polished 18-karat yellow gold hardware. Open gold rings with sphere dangles. Turquoise or naturally hued freshwater cultured pearls. Adjustable; lobster clasp. Approx. 30"L. Imported. Ippolita Rock Candy Short Stone Necklace, 18.5"
Ippolita necklace from the Rock Candy® Collection. Signature hand-hammered sterling silver. Bezel-set dark amethyst, clear quartz and African ruby doublet, clear quartz and turquoise doublet, orange carnelian, mother-of-pearl, aqua chalcedony, blue topaz, and orange citrine. Approx. 18"L. Imported.